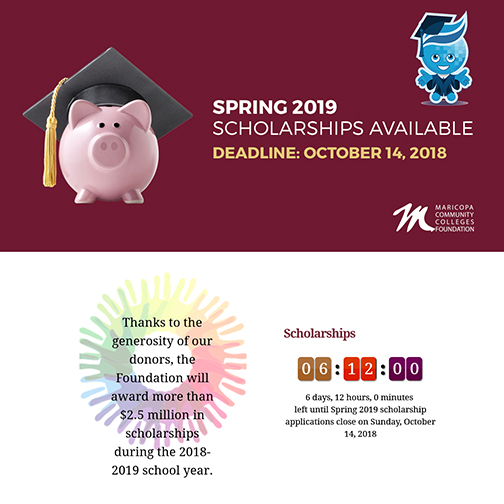 Time is running out to apply for spring 2018 Maricopa Community Colleges Foundation (MCCCDF) scholarships! The deadline-- Oct. 14. The prize-- more than $2.5 million in scholarships. Look for exclusive opportunities for Rio Waves like the James P. Hornburg Memorial Scholarship for students majoring in Law Enforcement and Corrections and the Dr. Linda M. Thor Scholarship, which is geared toward helping single moms. Veterans, there are also exclusive scholarships for you. The few hours you spend on a scholarship application will be a good investment. Don't discount those small scholarships!